Located within walking distance of great restaurants, ziplines, horseback riding and across the street from outlet shopping! Read our blog to discover the latest info on what's happening in the area and at our Sevierville hotel. The Oak Tree Lodge hotel near Pigeon Forge is your choice for lodging in the Smoky Mountains and the Sevierville area. Our Sevierville hotel is close to fine restaurants, exciting attractions and thrilling shows. Even better, we’re just across the street from the one of the best shopping centers in East Tennessee. Great money-saving specials and packages are available. You can save money on a stay at our Sevierville hotel, as well as the best attractions in the area. Oak Tree Lodge is great for large groups, family reunions, corporate retreats and more. We offer special group rates to make vacationing with a large group easy. Read our blog to find out the latest information about the area, our Sevierville hotel and things to do while you’re here! At the Oak Tree Lodge, we have more than a beautiful location. You’ll find a variety of exclusive amenities, including an indoor and outdoor pool with slide and an on-site convention center. Each guest can enjoy a complimentary full breakfast and can always expect friendly hospitality from our staff. 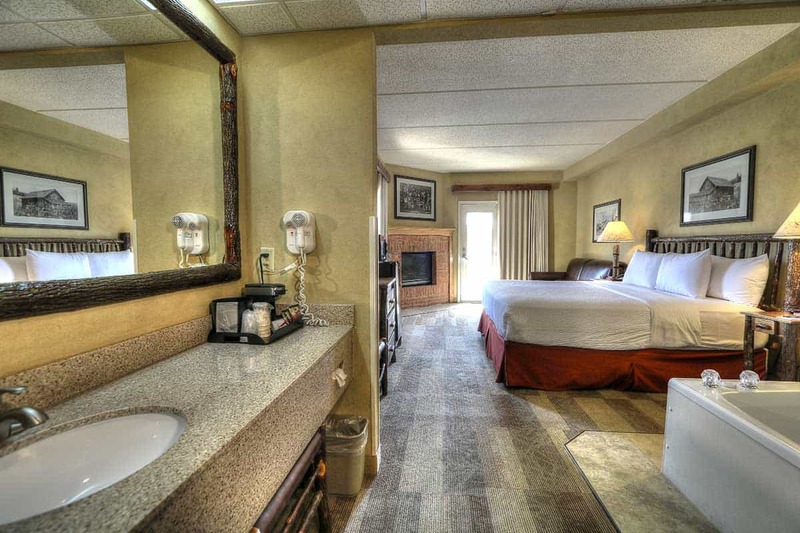 We offer large Sevierville hotel rooms with refrigerator and microwave, and some suites have fireplaces and Jacuzzis. Free wireless internet is provided on-site. Directly across from Oak Tree Lodge is Five Oaks Convention Center that will meet any meeting needs. All of our guests receive 1 FREE ticket to a selection of attractions in Pigeon Forge, Sevierville and Gatlinburg. Click here to learn more! A delicious, complimentary hot breakfast is provided daily for all our guests to enjoy and get their mornings off to a great start! Within walking distance you’ll find Five Oaks Riding Stables, Adventure Park Ziplines and outlet shopping! Fun is just footsteps away when you stay at our hotel in Sevierville.